Discussion is stirring over how Trump Supreme Court nominee Neil Gorsuch might rule on issues such as homosexuality and abortion should he be confirmed. 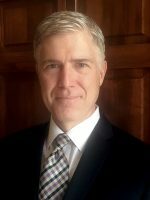 His former law clerk told reporters last week that Gorsuch was supportive of his “gay marriage,” but reports also note that Gorsuch outlined over a decade ago that he does not believe the courts are the place to effect social change. “He said, ‘This is a wonderful thing. You’ll see how your relationship grows,’” Goodbaum recalled.